Well, you should never trust the media, should you? I’ve just been on the phone with a Google spokesperson, who was keen to correct a number of mistakes in the reporting of the London Times and Pakistan’s The News; these articles had led me to conclude that Google had censored imagery showing Predator drones deployed in Pakistan, but now I think was wrong; Google says there was in fact no intentional redaction of imagery containing Predator drones at Shamsi airbase from Google Earth, nor was it ever asked to remove this imagery by the US government. So how can this square with the apparent removal of the imagery from DigitalGlobe’s inventory, and its absence from the recently introduced historical image archive accessible in Google Earth 5? The DigitalGlobe imagery of the Predator drones at Shamsi was not taken in 2006, as both the London Times and The News contend, but in 2004, says Google. It was visible in Google Earth from 2006 onwards, until its recent replacement by imagery taken in 2007. When this replacement happened is not something the Google spokesperson was able to pinpoint, but it would not have been in the last week or two, as there hasn’t been a general dataset update in that time. Thus The News was also inaccurate in stating that both the 2004 and 2007 imagery was still available on Feb 18, 2009, when in fact only the 2007 imagery would have been visible at the time of the article’s publication. The DigitalGlobe store corroborates Google’s explanation — there is indeed an image of Shamsi base available for purchase that was taken on July 2, 2004, and here is the low-resolution preview. (You can also find it with the DigitalGlobe default layer in Google Earth.) You can’t actually see the predator drones in the preview, as the resolution is too low, but absent me dropping a few grand to get my own personal high-resolution copy, I’m willing to give Google the benefit of the doubt on this, especially as the imagery will be available for free eventually (see below). This misattribution of the date of the drone imagery to 2006 instead of 2004 is also the reason why I didn’t find the imagery in the DigitalGlobe archive while researching my original post — it was there all along, but listed under 2004. What about the the fact that the imagery is missing from the recently introduced historical image archive? The catch here is that the archive is indeed “recently introduced”, says Google, and that means that not all the imagery available to Google has made it into the archive yet. According to Google, the rollout concentrated on making historical imagery for the most populated places available; Baluchistan is clearly not such a place. 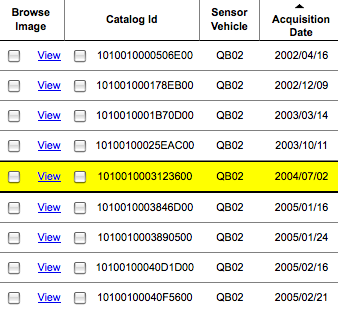 I was assured that the imagery from 2004 showing the Predator drones is in Google’s possession, that it is in the queue for inclusion in the historical archive, but that Google just hasn’t gotten around to it yet because of the backlog. Since that explanation is also a promise:-), it will be easy enough to verify this claim in due time. Heh…Stefan, you’re so funny sometimes! I really chuckled both at your ability to admit your own hypocrisy combined with the ability to joke about using this approach as a reporting tactic to get Google to respond on issues like this. Classic! Of course, if we posted about every mistaken news story, we wouldn’t have time or energy to post about the good stuff! Excellent. You jump to stupid conclusions and somehow blame the media. Do you not see any irony in your claim? Regardless of the mea culpa, censorship, in whatever form it presents itself, is an important topic of discussion, either in the blogosphere or, hopefully, in the classroom. Thanks for bringing this to our attention.